Hudson, OH - From Summit Metro Parks, "First Energy is continuing utility pole replacement work along the Bike & Hike Trail in Stow and Hudson. A trail closure will be in effect for the section of trail at Hampshire Road heading north to Barlow Road. The closure will be in effect until November 5, which is an extension of the original projected completion date." "[On Nov. 5] First Energy expects to begin utility line work between Barlow Rd and State Route 303 in Hudson. A trail closure will be in effect for the duration of this project, which is expected to last approximately seven weeks..."
Boston Heights, OH - From Summit Metro Parks, "The Bike & Hike Trail at the Boston Heights tunnel just south of Route 303 will be closed for approximately four weeks. There will be a signed detour available across Akron-Cleveland Road." Hudson, OH - From Summit Metroparks, "First Energy is continuing utility pole replacement work along the Bike & Hike Trail in Stow and Hudson. A trail closure will be in effect for the section of trail at Hampshire Road heading north to Barlow Road [a 2.2 mile segment]. The closure will be in effect until October 15." Ohio.com reports that the section between Barlow and state Route 303 in Hudson is expected to close Oct. 15. No time table is give for when this section will reopen. Northfield, OH - From Summit Metroparks, "The Route 82 north parking lot is closed due to a sinkhole that has developed near the entrance. The trail itself and the Route 82 south lot are unaffected." Boston Heights, OH - From summitmetroparks.org, "The Bike & Hike Trail will be closed between Hampshire Road in Stow and Route 303 in Boston Heights beginning Thursday, 3/1 through Saturday, 3/31 while FirstEnergy and its contractors complete forestry work. "No detour is available during the temporary closure. The Route 303 parking lot and trail to the north are unaffected by the project and will remain open." From summitmetroparks, "The Akron Bike and Hike Trail, between the SR 303 trailhead and Route 8, will be closed from Tuesday, 1/16 to Friday, 1/24 while a contractor collects soil borings." From summitmetroparks, "Work continues on the The Metro Parks Bike & Hike Trail at the new tunnel between Norton and Sowul roads in Stow. "Beginning Monday, 8/14, daily closures will be in effect for approximately three weeks as contractors pave the trail in the area." From hudsonhubtimes, "Officials from the Summit Metro Parks are asking for the public's assistance in helping to prevent break-ins like a series of seven that were reported July 20. "Seven cars parked in six locations had windows smashed and purses taken, according to rangers. 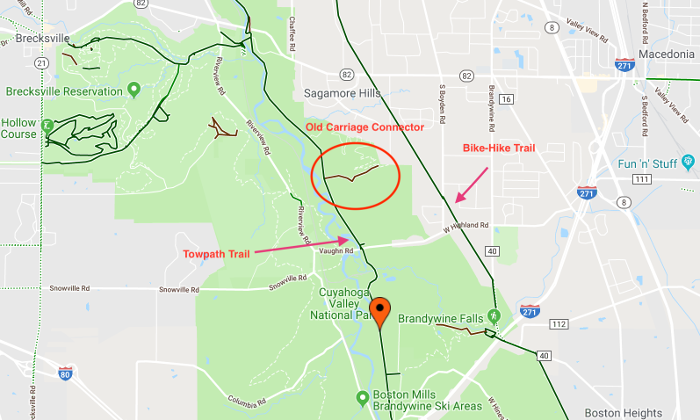 "...the break-ins happened in Hudson at the Bike & Hike Trail/Route 303 lot; in Akron at the Ohio & Erie Canal Towpath Trail/Memorial Parkway lot; in Akron at the Ohio & Erie Canal Towpath Trail/Big Bend lot; two in Fairlawn at the Sand Run Metro Park/Revere Road lot; in Springfield Township at the Springfield Bog Metro Park and one in Munroe Falls at the Munroe Falls Metro Park Lake Area." 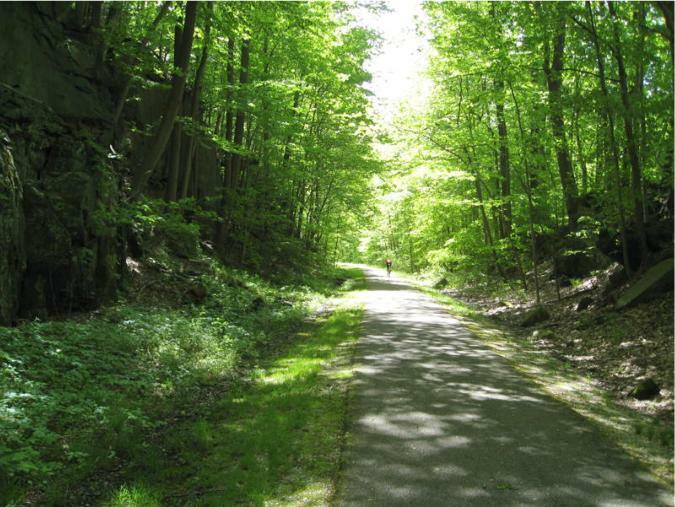 From summitmetroparks.org, "The Bike & Hike Trail, from Sowul Rd. to Norton Rd. in Stow, will be closed from 7 a.m. to 4:30 p.m. on Friday, 7/14 and Monday, 7/17. The trail will be open on the weekend. There will be additional trail closures in the near future as the contractor for ODOT and the City of Stow works to complete the project." From summitmetroparks.org, " A bicycle ride of up to 500 people will take place from 9 a.m. to 4 p.m. between Highland and Hines Hill roads, and between Boston Mills and Barlow roads." Facilities: Several locations along the trail. Worth Noting: The sections that follow road routes are in the southern loop portion of the trail. The bikeway terrain ranges from relatively flat to gently rolling with turns. Sections run through rural areas as well as residential neighborhoods. Variety is the key word here. Just as you're settling in and getting a feel for the trail it soon changes... then later it changes again. This portion of the Bike & Hike has a distinctly different personality from the rest of the trail. 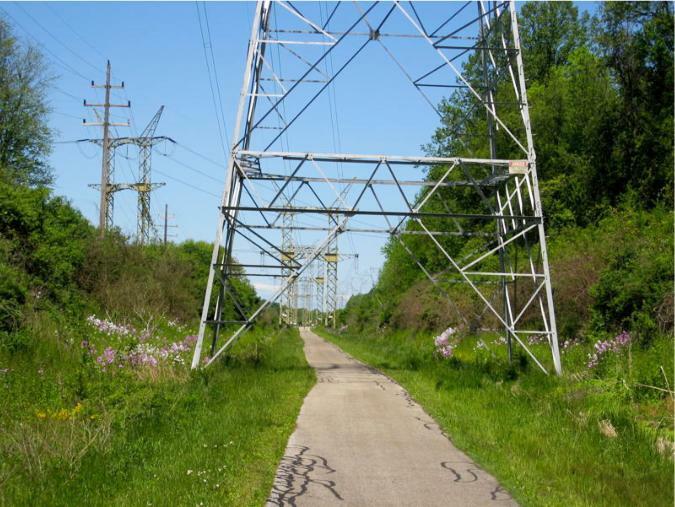 Some of it follows a utility right-of-way which leads the path directly between the legs of electric towers. At road crossings the trail ramps up slightly to reach street level. Several of these crossings do not provide a good line of sight for cyclists of oncoming traffic, so use caution here. Heading south on the bikeway from Boston Mills Road the trail is generally flat and smooth. Signs at road crossings provide you with street names and the distance to the next crossroad further down the trail. If you think of the bikeway as a main transportation route and the crossroads as exits, you can see how this provides great information for trail users, particularly if you're inclined to explore the surrounding area. A short section with rock outcroppings provides interesting scenery on your way south. Further along the trail takes on a more rolling, turning course and does a good job of avoiding too many sharp turns. The southern part of the bikeway splits into 2 trails just after you ride over the Rt. 8 overpass. A sign marks the split. 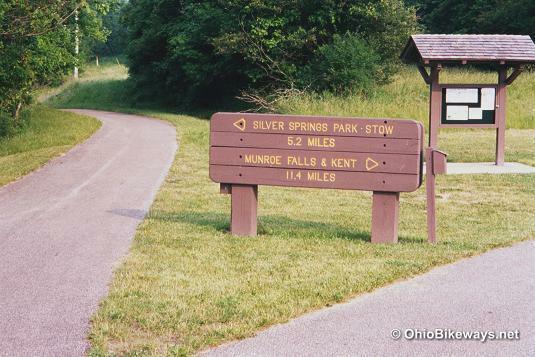 Continue straight ahead and you're on your way to Silver Springs Park in Stow. Turn right and you're traveling to Silver Lake and Munroe Falls. Regardless of which route you choose, the entire southern end of the trail is tied together to form one large loop. This is accomplished using bike route signs to direct you along streets between trail sections. If you ride southeast toward Stow, you'll turn south on Young Rd to connect with the Stow Bikeway to continue on the Bike-Hike. If you miss this turn, or decide to continue riding straight at Young Rd, you'll be riding into Portage County on a portion of the Portage County Trail. The southern most portion of the Bike-Hike Trail makes its way along the Cuyahoga River. Here you'll find access points to the river as well as restroom and water facilities right along the trail. A trail sign marks the 1.5 mile Kelsey Bikeway that connects to the trail at Munroe Falls. This spur takes you past Kennedy Park and ends at Galt Park. You'll rack up mileage quickly on this 32.3 mile trail. Keep in mind that doubling back to your car will bump up your totals. We totaled 48.5 miles which included a jaunt over to ride a short segment of the nearby towpath trail. If you ride the entire southern loop, 5.7 of those miles will be on connecting road routes as well.